Most often tables are created, stored and distributed in the format of the table editor Microsoft Office Excel. A little less often for these purposes use a word processor Microsoft Office Word. Both apps allow you simply print out the electronic table, pre-arranging the best option of its placement on the sheet. - word processor for Microsoft Office Word 2007 or 2010. If in addition to the tables in the document loaded in the word processor Microsoft Word, there are text or any other elements that print is not required, better to temporarily relocate the table in a separate document. To do this, first copy the object, move the cursor to the upper left corner, click the little square icon with plus sign and click Ctrl + C. Then create a new document (Ctrl + N) and paste the table (Ctrl + V). If you are using the word processor Word 2010, click "File" and select "Print". To the right of the command list in the menu column is placed with the print settings, and more to the right - the picture preview of the printing sheet table. With preferences pick the most suitable print settings - select the size of indentation from the edge of the sheet, specify portrait or landscape orientation, adjust the size to the width of paper used, etc. All changes will be displayed in the picture preview. When ready, click the big button "Print" at the top of the column settings. In Word 2007, all these settings in one place you can see in the dialog box "page setup". To his cause, go to the tab "page Layout", open the drop-down list "Field" and select "Custom fields". In version 2010 this option to access the print settings too. 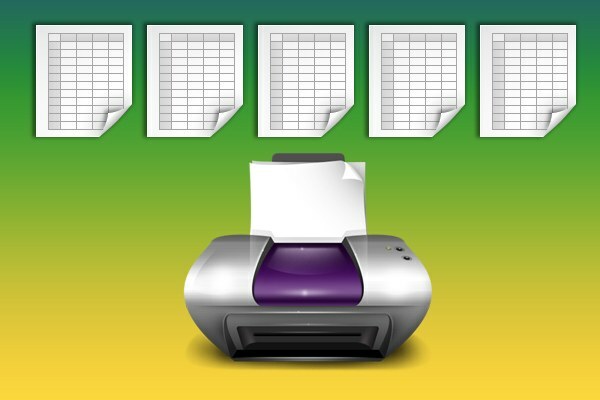 After setting all parameters, click the OK button and open the send dialog to print using Ctrl + P.
The procedure for printing tables from Microsoft Excel differs little from those already described. In the picture preview of the printing sheet in Excel 2010 is a useful addition - in the lower right corner is placed the button "Show field". Click on it and you will have the opportunity not only to drag the horizontal and vertical margins on the printed page, but in the same way to adjust the column width of the print layout. As in a word processor, the tab "page Layout" menu in Excel 2007 and 2010 there is a drop-down list "Fields" to "Custom fields" which causes a separate window. The same settings as in Word posted here on the four tabs instead of three. Of the supplements on the layout tab, you can specify the output sequence of three or more tables on a printed sheet (top to bottom or left to right).